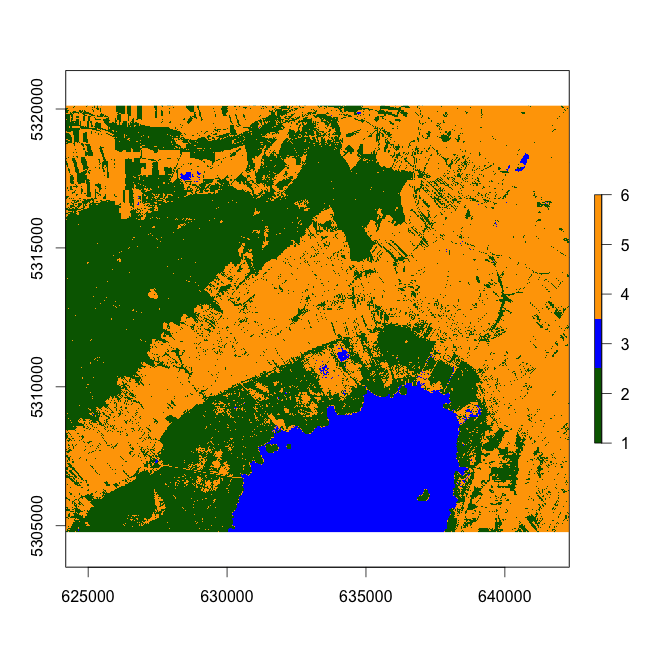 Today I am going to show you how to perform a very basic kMeans unsupervised classification of satellite imagery using R. We will do this on a small subset of a Sentinel-2 image. Sentinel-2 is a satellite launched by the European Space Agency and its data is freely accessible for example here. 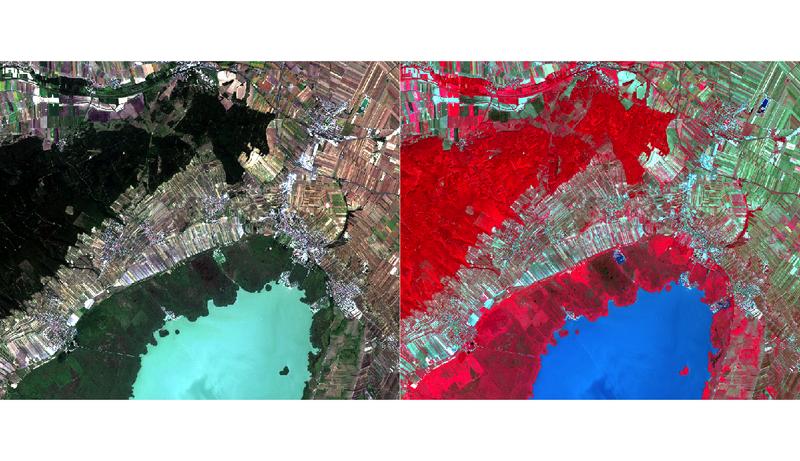 Lake Neusiedl as seen by Sentinel-2. The lake is surrounded by a reed belt and intensive agricultural activity. In the north-west of the image a deciduous forest can be seen. Please note that you can use any other image of your choice to perform the classification. The code will stay the same! Voila! Our image is in R! If you don’t have the raster package installed, please execute “install.packages(“raster”) first. The default visualisation is not the best I have ever seen, but okay… it’s a good start. You can see six different colors each corresponding to a spectrally similar area. Agriculture is roughly depicted by 4,5 and 6. Unsupervised kMeans classification with class coloring. Darkgreen indicates reeds and forest, orange depicst agriculture and water is shown in blue. We can see that water is very well captured by the classifier and agriculture is also detecetd quite well. Reeds (surrounding the lake) and forest (north-west of the lake) however seem to be mixed and we can see a big confusion inbetween those two classes. The unsupervised kMeans classifier is a fast and easy way to detect patterns inside an image and is usually used to make a first raw classification. It is popular due of its good performance and widely used because no sample points are needed for its application (as opposed to a supervised classification). My intention however was to detect six different classes and the algorithm was only able to distinguish roughly three. By increasing the “centers” parameter it might be possible to detect more classes. A second option on how to make a better classification would be adding more bands as an input (for example the red-edge or short wave infrared Sentinel-2 bands). In an upcoming post however I will show you how to perform a supervised classification (with sample points) using R and then we will compare both results. Martin was born in Czech Republic and studied at the University of Natural Resources and Life Sciences, Vienna. He is currently working at GeoVille - an Earth Observation Company based in Austria, specialised in Land Monitoring. His main interests are: Open-source applications like R, (geospatial) statistics and data-management, web-mapping and visualization. He loves travelling, geocaching, photography and sports. Thank you for this. code. could you please write the code for the unsupervised classification using maximum likelihood. 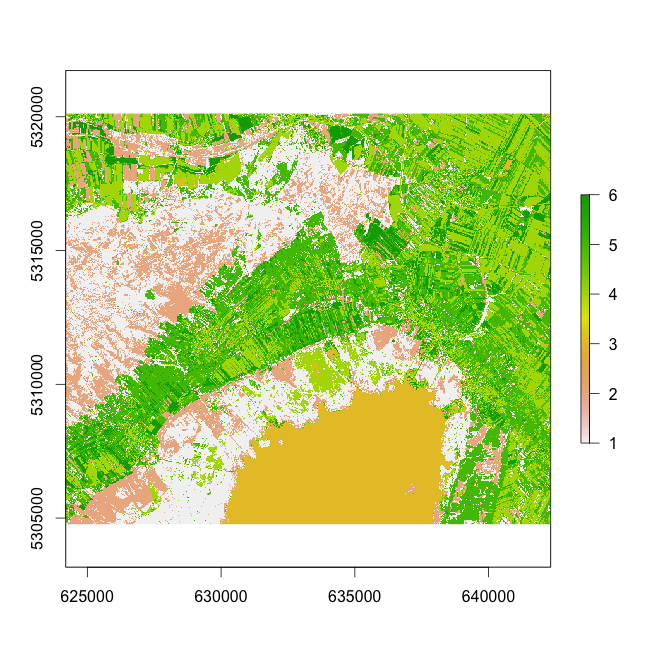 I want to work on the Land use Land cover and its change detection. i want to do this using R code. you will be the coauthor of this paper.